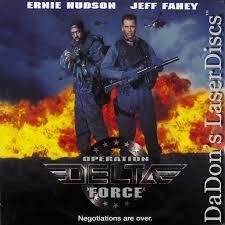 Ernie Hudson and Jeff Fahey team up again (or was this the first time? ) for another movie the looks like Die Hard on a train. Although, it has more to it than that. It’s just too bad that the more to it had nothing to do with Chuck Norris. Operation Delta Force seems to be somewhat of a spin off of the Chuck Norris series of movies than anything else, with the movie being about the Delta Force just not about Chuck Norris being any part of it. Jeff Fahey takes over the lead ( A part he technically took form Chuck Norris’ son who stars in the third installment which I have yet to see (For that matter I don’t think I saw Mike Norris in anything). Jeff Fehey and his team are in South Africa taking down some mercenaries who have two viles of something The U.S military don’t want them to have. Ernie Hudson plays a counter terror agent that got Fahey’s charterer’s brother kill a long time ago, making it hard for him to listen when the counter terror agent is telling him their is a corrupt agenda to this mission. That’s a big difference between Chuck Norris Delta Force and Operation Delta Force. Chuck is all about being One hundred and ten pure hero and whenever he went after the bad guy they were One Hundred and Ten percent bad. This new Delta Force wishes to be a little more complex than that, as the world is complex and so are it’s politics. If I remember correctly, Operation Delta Force is actually a made for cable movie. I do recall seeing advertisements on HBO for the premiere of the movie (Don’t want to spoil anything but the ending did make the movie feel like it could have been a TV pilot). Most likely this is why they changed the franchise from Delta Force to Operation Delta Force so as to keep the budget low (Amazing what a simple name change can do). As far as Operation Delta Force mimicking the real team it’s based on, I don’t know how good of a job they are doing but it’s cinematic impressive. You can’t quite call this film Delta Force on a train cause the whole thing does not take place on a train and it’s not about saving hostages (Which from what I understand is actually the full purpose of the actual Delta Force. In fact the movie starts out with the US military needing to get those viles back as soon as possible and the only trained squad who could do it quick enough was the Delta Froce who just finished combat training in the area and were about to do some R&R.). Watching the whole mission go down was slightly fascinating, even the small talks in the war room. An interesting side note was the fact that one member of the Force has a wife due to give birth any day so when it happen the Admiral felt it important to tell him before he left that he was a dad, and all I’m thinking is that this admiral just signed this dudes death certificate. They had more scenes like this with one of the delta force members being a rookie woman and one other member not convince she has what it takes simple because she’s a woman. I’ve never done military service myself but from a civilian point of view even for the 90s when this flick came out this seems like such a dumb story arch to have any shoulder having to prove himself because of what they look like, or maybe I’m just that woke to think that any one with a gun in their hand is the perfect match for anyone else with a gun in their hands (I’m not that woke). Overall the military tactical stuff was fun to watch but individually I feel each actor could have had more training. Ernie Hudson is a Ghostbuster not a soldier so his gun play and knife handling had to be done mostly with the use of movie magic but certain scenarios were too dramatic, and it made it look fake. Sometimes people don’t realize that stunt performing is acting too and I feel these filmmakers either did not fully get it at times or just did not have the time to get. Will think towards the latter with this as I’m sure this movie was made quick and cheap. I do wonder if when it comes to movies like this do you take into consideration how many times Jeff Fahey has played a cop or a soldier and how that gives you one less man to spend time and money to train?